Last month, I shared that October would include 31 Days of Amazement as I partner with seven of my best blogging friends to share our passions on different topics. I initially thought my 31 days would lean completely toward personal/family finance and frugal tips, but as I process what that little phrase means, it encompasses so much more. The phrase “More with Less” represents multiple concepts to many people. More Time, More Money, More House, More activities, more, more, more….our American culture denotes a society that is mesmerized with not just more stuff, but the right stuff, the right place, the right time. We have a huge case of “stuff-itis.” This month isn’t going to be about accumulating more, it’s going to be about engaging ourselves more with the every day: capturing those moments that you other wise might miss, but also understanding that our concept of money has a role in that process. I assure you that we are going to have fun carving out a few creative moments to look at how we embrace the day to day right now. I may challenge you a few times, make you laugh at me a few times, and hopefully encourage you a few times, but in the process, we’ll begin to cultivate a sense of newness and purpose. Why am I doing it? Because our family needs this reminder as well. With five children, the culture and busyness have robbed us of some things I am fighting to get back, but it’s rough. 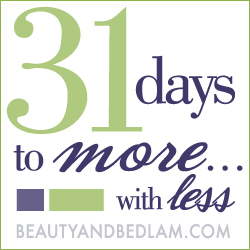 I want to walk right along side you as we become more intentional…together – 31 Days to More with less. P.S. Don’t miss my sweet friends below. If you can’t remember their topics, refresh that memory at my first post – 31 Days of Amazement. How exciting to participate in this 31 day challenge. I love many of your blogging sisters. I cannot wait to visit each one and see what I can learn. I love the idea of learning to live with less. My less was kind of forced upon me when my husband and I had to sell our dream home and are now living in a temporary house owned by a friend. But I must add that material possessions are less important to me now as I realize how fleeting they can be. I am an eager student! I love that you used the word ‘intentional’. I think it’s my favorite word. I just discovered this 31 day series. I look forward to following you and your friends. Thanks for sharing this is such a great idea! It’s funny how we’ve gotten so used to the busy and forget about being intentional with our time, especially because we think we are. Can’t wait to hear what you have to say! Excited to do this! Thanks!!! Ditto to Nester! Love it. Can’t wait for all you have to share. What a great topic. We’ve talked alot as family and as a church about living intentionally! Can’t wait to read more. I am very excited to get on board with you on this, love the word intentional. The busier I get the more I realize the need and the blessing of that word!! Love this. Love this a LOT. Cannot wait! What a wonderful series. I am super excited to be following along to refocus. What a challenging month. Kudos to you!